Last night my 13 year old daughter came home from a babysitting job with super sad news. A little girl that she adores, and loves to babysit, took a tumble earlier in the day - luckily NOT while under my daughter's watch - and had broken her arm. Miss M really wanted to do something for her little friend so even though it was late, we headed to Walmart for a treat. 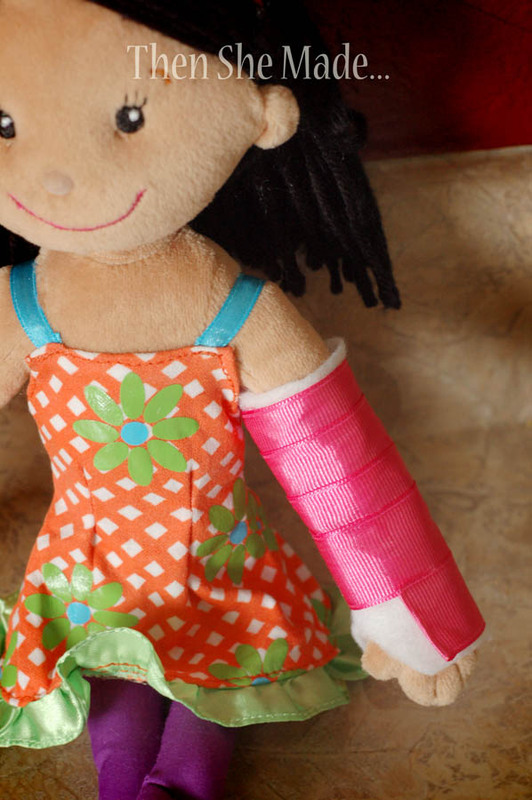 We ended up coming home with a cute little doll and decided to make the doll a customized removable pink cast. 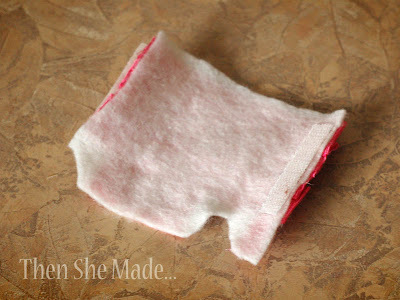 Step 1: Cut a piece of felt to size so that it fits the doll arm and slightly overlaps. You'll end up with something like below (ignore the pink on the edges, this was taken after the cast was already made.) The little notch is where the thumb goes. Step 2: Cut strips of grosgrain ribbon and using hot glue, adhere them into place on top of the felt. You want them to slightly over-lap each other so that it looks like the texture of a real cast. 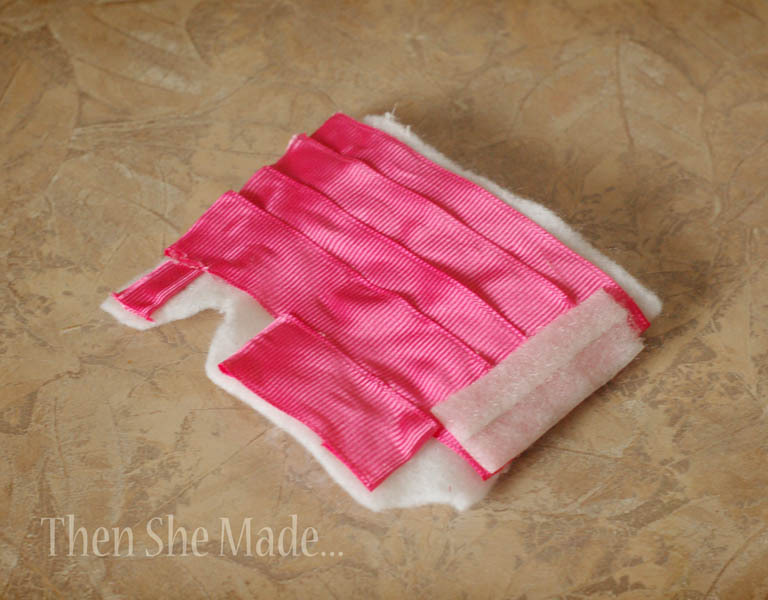 Step 3: Adhere some small strips of Velcro and then add cast to your doll. Seriously, it really is that simple. 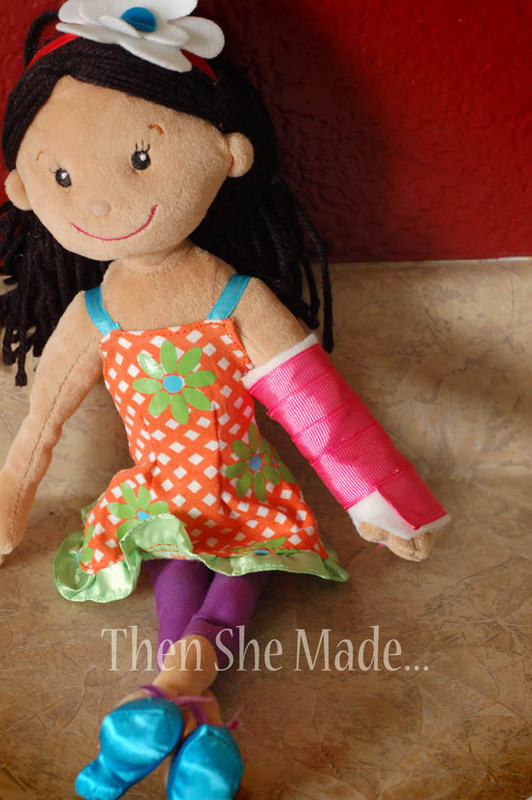 Now our cute little friend has a snuggly little doll with a cast that is just like hers. Some how I think it makes having a broken arm just a little more enjoyable. Okay...this is just adorable. I don't have children (yet) and therefore normally don't read a ton of toy-related posts, but I couldn't help but be drawn to this one. I'm remembering this for future reference! Your cast is by far the most realistic cloth cast I found. It was easy to make, infact I made them to fit dolls, my daughter and son. I used it to pull a April Fools prank (which worked extremely well) and I shared it on my blog. I hope you don't mind, but I referenced your site. Thanks! Thanks for the directions. Just made a cast for my son's stuffed monkey. It looks great, and my son loves it. Perfect!